A growing tumour exerts considerable ongoing abnormal pressure on the healthy neighbouring cells. The CNRS/UPMC/Institut Curie team directed by Emmanuel Farge, Inserm Research Director at Institut Curie, has just discovered that this force can induce tumour gene expression. The physical stress induced by tumour growth might even trigger the initial phases of malignant transformation in the adjacent tissues. This major discovery is published in the 11 May 2015 issue of Nature. While a tumour is actively growing, it gradually induces an abnormal and permanent pressure on the healthy neighbouring cells. Could this stress transform compressed healthy cells into tumour cells and affect the development of the tumour? This is the novel approach adopted by the Mechanics and Genetics of Embryonic and Tumoral Development team led Emmanuel Farge, Inserm Research Director. First, using experimental models, the researchers measured the pressure exerted by the growth of a colon tumour on the adjacent tissues. In doing so, they demonstrated that this mechanical stress activates the beta-catenin signalling pathway in the healthy tissues adjacent to the tumour, leading to the activation of tumour genes. “Beta-catenin is well known to activate tumorigenesis in many cancers,” notes Emmanuel Farge. Using magnets and healthy tissues loaded with magnetic liposomes, the team then mimicked the mechanical forces induced by a tumour in the surrounding tissues, and observed the consequences. “After two weeks of such mechanical stress, we observe an increase in phosphorylation (i.e. activation) of beta-catenin, together with its translocation to the cell nucleus,” observe the scientists. Under the effect of the stress, the beta-catenin protein detaches from the cell membrane to enter the nucleus, where it then activates oncogenes that promote tumour growth. After a month, overexpression of the c-Myc oncogene, a target for beta-catenin, is then detected, which causes uncontrolled division of healthy cells, as well as overexpression of the target gene Zeb-1, which is responsible for the loss of cell adhesion that leads to invasiveness and metastasis. In addition, it might contribute to tumour heterogeneity: the tumorigenic processes triggered in the adjacent cells might generate tumour cells with characteristics that are distinct from those at the core of the tumour and different in their type of response to treatment. This method of proliferation might thus constitute a factor in resistance to therapeutic treatments. Everything is therefore not purely biochemical in the development of colon cancer. Abnormal mechanical stresses, activating tumour biomolecules, thus appear to be a potential new engine for tumour progression and invasion. 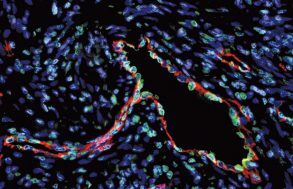 This discovery reveals that mechanical stresses caused by growth of the tumour are likely to modify the healthy cells adjacent to it, activating the malignant transformations that boost its development. 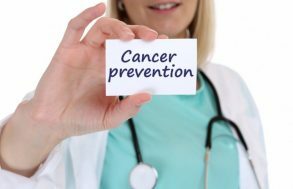 These data should therefore be incorporated into therapeutic approaches, since the complete elimination of tumours should include action on all mechanisms used by the tumour in order to grow.